When I get invited out to an evening of bowling with friends, I’ve never been able to look forward to a craft beer at the lanes. For a craft beer fanatic like myself, that can be a bit frustrating, as in almost every other context or scenario, I have access to unique and amazing craft beers. Indeed, with all the new breweries opening in Utah, I’m often spoiled for choice at my favorite bars, grocery stores or even the State Liquor Stores. 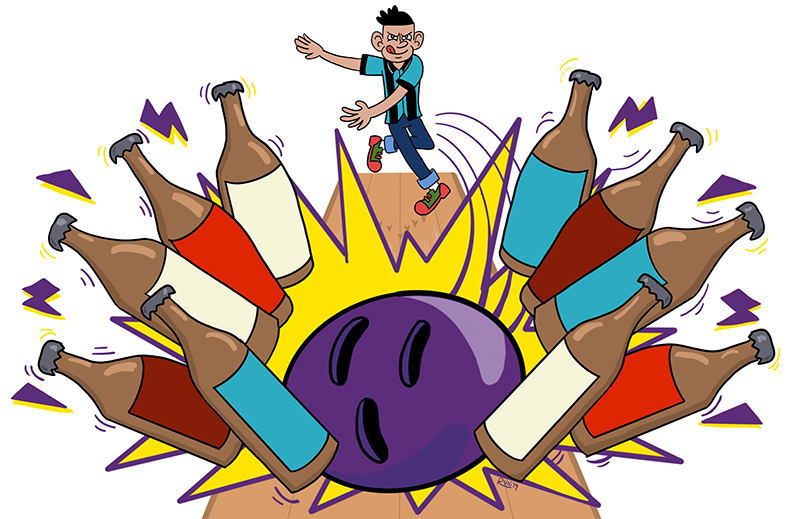 But during a night of tossing a 14-pound ball as hard as I can at some wooden pins in a vain attempt to get a decent score, I can’t even seek relief in something better than a mass-market lager? 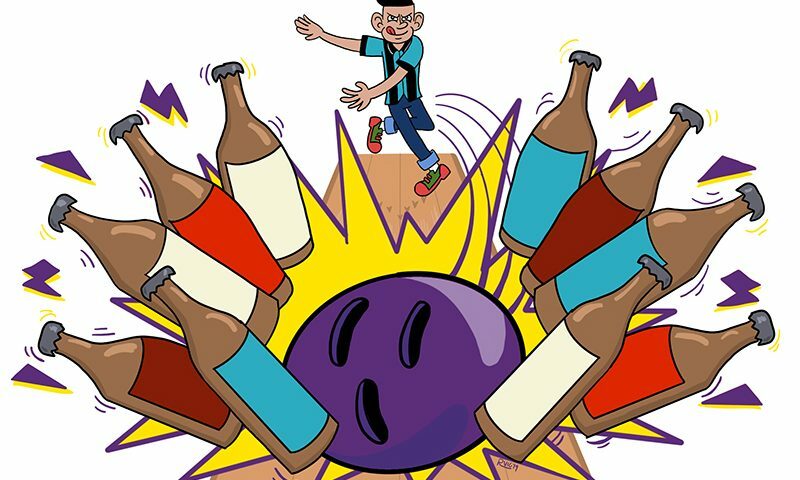 All Star Bowling and Bonneville Brewery are seeking to change this situation with a new concept called Pins & Ales, a more adult-oriented bowling experience. Bonneville Brewery was founded in 2012 when Brad Shepherd, Owner and proprietor of the All Star Bowling & Entertainment locations in Tooele and the Salt Lake Valley, purchased the building that had been Tracks Brewing Company in Tooele, Utah. Fast-forward to 2019, and Bonneville’s beers like Pilot Peak Pilsner and Redline Irish Red are available in bottles in some stores, of course at their Tooele brewpub and also at all the All Star Bowling locations. Being able to get craft beer at a bowling alley is a good start, but Shepherd wanted this partnership to go further. The Pins & Ales concept was developed to provide a completely unique experience, unlike anything else in Utah. This starts with a separation from the rest of the diverse attractions present at the Draper and Tooele All Star Bowling locations. Upon entering, there is an arcade, event spaces, laser tag, an escape room and—of course—lanes upon lanes of bowling. But Pins & Ales is something different. Separated into a different room by a threshold where patrons get ID’d, the vibe in there is totally different; the seating is comfortable and luxurious, the house lights are dimmed—almost like a club—the music is a bit more adult, and the bar is prominent. I ventured with a handful of friends to visit this promised land of adult bowling on a Monday night, so it wasn’t overly populated. I asked the staff about how they handle the busy weekend nights. One of the great things about Pins & Ales is that there is ample waiting area near the centrally located bar, including an ample patio and VIP area as well. While my comrades donned their shoes and found their weapons of choice, I checked out the drinks menu and was excited to see a wide selection of interesting cocktails, wine, spirits and the main event: craft beer from Bonneville Brewery. I started with Sir Malcolm’s stout, a full-bodied and roasty Irish stout served on nitrogen, with notes of chocolate and coffee. It must have been a good first choice, as I was rolling boulders in the first game. A handful of strikes and a few spares later, and I had my best score of the night (a respectable 176). I was ready for my next beer. We ordered some tasty appetizers from the extensive house-made menu to go with the next round. The deep-fried Mac & Cheese Balls ($7.99) came with cilantro ranch that was a perfect pairing for a cold glass of a balanced and malty Vienna Lager. The Classic Nachos ($8.99) were a heaping pile of real ingredients, not the plastic-looking sauce and stale chips that I choke down at most bowling alleys. My friends recommend them with the refreshing Pilot Peak Pilsner. The second game saw my scores and consistency start to decline, but I wasn’t distraught. It was hard to be upset while sitting on the comfortable couches with a quality beer in hand. I rounded out the third game with an acceptable score, despite having my hands a little greasy from the delicious P&A Reuben sandwich ($10.99), with crispy marble-rye bread. I washed this down with an Antelope Amber Ale. My friends felt the same way, and we finished the night not overly concerned about how we bowled. With a brand-new All Star Bowling location opening at the Valley Fair Mall in late 2019, the Pins & Ales experience will be coming to West Valley and be that much more accessible to beer and bowling enthusiasts all over the Salt Lake Valley.